bebop spoken here: Burton Agnes Jazz Festival - July 13, 14, 15. Last weekend saw another glorious celebration of Jazz and Blues, with an additional mix of soul, Latin, rock, funk and folk in an idyllic setting. Glorious weather too, appreciated especially by those camping in the adjoining field. 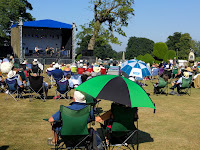 Burton Agnes is a delightful festival on an intimate scale with excellent facilities and a friendly, family atmosphere. At 6:30pm on Friday, the main stage kicked off with Tiptoe followed by rhe cleverly named ElecTrio. Matt and Carlos, a guitar duo, started Saturday afternoon off in mellow, Latin, fashion followed by Zoe Gilby and band, Zoe needs no introduction to readers of bebop spoken here, and, not surprisingly, was very well received by the audience basking in the sun and the music. Ubunye injected Zulu power to their vocals as well as a personal story. On to Saturday evening and Jo Harrop presenting her excellent tribute to Peggy Lee both as vocalist and songwriter. The final main stage act was the Grammy-nominated and Emmy award winner, Billy Branch (harmonica) with the Giles Robson Band. Stunning, raw Chicago Blues and wonderful harp playing for a dancing, grooving audience. Sunday brought Skeltr, followed by a good soul set by Kyla Brox, vocals and Danny Blomely, guitar. Atlantic Crossover, gave us their revived exposition of the Atlantic Sound and finally, the customary set from Ben Beattie's After Midnight Band plus festival organiser Simon Cunliffe-Lister on sax; a rousing finale to a great weekend. See photo. Tickets for next year's festival, 12th to 14th July, are currently on sale at super early bird price until 31st August, from the Burton Agnes website. Recommended.